Noodlecake Studios with Woblyware and Ravenous Games have produced another simple 2D platformer that manages to be both interesting and consistently mundane. That isn't to say it isn't worth playing though. The premise is that a massive Easter Island looking stone head wants you, a duck, to collect all his golden eggs. But this plot is barely given much thought- the chief draw here is the ability that the head bestows upon the duck- to flip gravity. You can't jump at all, you simply reverse gravity and fall in the opposite direction. A giant stone head and a duck. What more could you ask for? This simple new power is used in conjunction with some gravity rotating yellow orbs to solve roughly 100 levels of short puzzles. There is nothing to strenuous in terms of puzzles- nothing to rack your brain with- but the concept does prove to be fun enough to want to keep playing. The lack of challenge is low enough that you can nearly always tell what to do as soon as the level begins. The downsides are the controls were occasionally unresponsive leaving players slightly frustrated when a lack of response movement leads directly to death. In addition, sometimes you need to dive blindly into areas and die because your view is severely limited in places (no camera movement). Once in a while the enemy laden areas need a bit of trial and error to figure out due to their swiftness, but it isn't too awful. A fashionable top-hat is the reward for collecting all the golden eggs. 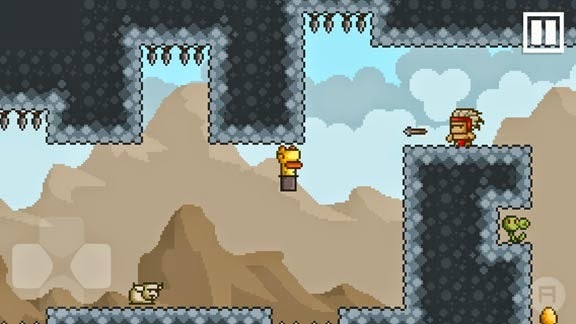 For only a dollar, Gravity Duck provides plenty of simple, cute, and pixely puzzling entertainment. Perhaps the gravity manipulation and level design for the coming "City" DLC will prove to add a little more variety for our entertainment. I hope they add some more progression, balance, and flow to the levels and challenge to come- I would like more of a sense of achievement from the puzzles- something a little more like a 2D version of the phenomenal PS Vita game Gravity Rush. There is a wide range with the concept they've used, if only they'd take it to the next level of its potential.